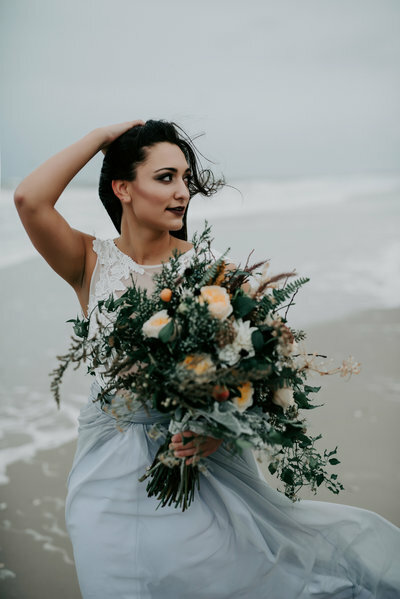 This gorgeous spring Ocean City NJ wedding was a great way to kick off spring at the Jersey Shore! Danielle and Kevin’s day could not have been more perfect. The Flanders Hotel is a fantastic venue for an vintage inspired beach wedding. The Manic Botanic, created the flawless florals seen throughout the day. Danielle’s insanely gorgeous Maggie Sottero Wedding Dress and Badgley Mischka shoes were the perfect picks to effortlessly pull off the Old Hollywood look. The girls had a blast getting ready in their suite at the Flanders before helping Danielle make her way to the beach for an epic first look! Kevin patiently waited on the beach, with hundreds of bystanders trying to get a glimpse of this special moment from the boardwalk. Claude used the drone to capture the drama from above, as Danielle’s dress looked exquisite in the sand. With the Ocean City boardwalk being steps away, we were able to enjoy some of Danielle and Kevin’s favorite locations like Kohr Brothers ice cream and Gillian’s Wonderland for bridal party pictures! The hallway into the ceremony at the Flander’s was an enchanting spot for photos. A mirror lined hallway with soft light made for an ethereal ambiance as Danielle and her dad walked down the aisle. An intimate, romantic room awaited with hundreds of candles and flower petals dusting the aisle. With numerous emotional poems and readings, there was not a dry eye in the room. Kevin and Danielle “tied the knot” in a literal sense as well during this sweet ceremony. After the ceremony, guests enjoyed a fantastic cocktail hour and raw bar before making their way into the party! You can tell this crowed was ready to let loose and dance with the impromptu Hora dance. Danielle and Kevin surprised guests with an impressive spread of boardwalk treats including Manco & Manco pizza and Johnson’s Popcorn at the end of the night. This Ocean City NJ wedding was so much fun to capture! Congrats Danielle and Kevin!